Russia is the 10th largest export economy in the world and the 27th most complex economy, our report on Russian customs export data has revealed. We at RussiaExim bring every secret behind the Russian export business through trade statistics of Russia. Our Russia export data is compiled with bill of lading detail that is checked thoroughly by our database team in order to provide our clients accurate export data of Russia. We collect Russia export statistics that is based on customs details and verify each and every Russia trade figure before supplying the Russia trade data to our clients. We provide the Russia shipment data of total exports on any product that is exported by sea or air through all Russian ports. We at RussiaExim are the most trustworthy market research destination from where you can access to cent percent accurate Russia trade data along with the research report on Russian exports. Our export data of Russia is entirety based on genuine shipment records that are delivered to our clients after verifying each and every trade figure. So, you can take our best market research services for accessing latest export data of Russia. Our accurate export data of Russia provide great benefits to your export business. From the list of Russian exporters to market analysis of Russia, everything is available in the Russia export statistics. Let’s go through the business benefits that can be availed through the Russia shipment data of exports. If you own and operate an import export business and want to export the products from Russia to sell them into the local market, you will find the Russian exporters list in our Russia export data. Through our Russia export statistics, you can track down the each and every shipment that takes place through Russian ports. We provide you authentic export data of Russia through which you can track down your competitor’s shipment. As a result, you would be able to know their business secrets and improve your business performance. Our Russia trade report along with the Russia export statistics will help you in analysing the market trends of Russia and demand & supply of products as well. If you are new to import-export industry, you would definitely find business risk in trusting the new Russian suppliers of your products. But we can reduce your business risk and keep you away from frauds by providing the genuine list of Russian exporters for your products. Get with the most latest & authentic export statistics of Russia with genuine shipment records at this trusted platform. See the Russia export sample below and understand how we provide export data of Russia and which data fields we cover in customs data of Russia exports. According to export data of Russia, the country recorded a major decline in the export value of total products in 2015. January and February were the slow down months for Russia in which export value of products fell tremendously. After recording a rise in the export value in March, the country registered decline and almost similar export figures in April, May and June. Thereafter, Russia recorded a decline in value of total exports in July and fluctuations in export value of later months of 2015. Access the table below in which you will find complete trade figures of Russia exports recorded in year 2015. According to the customs data of Russia exports, Russia exported crude petroleum oil the most in 2015. Iron & steel, fertilizers and machinery stood at 2nd, 3rd and 4th position as Russia exports respectively in this year. 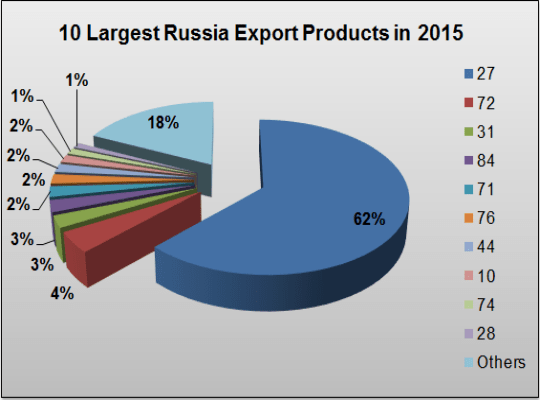 Let's have a look on the Russia export statistics of top 10 products, which Russia exported in 2015. 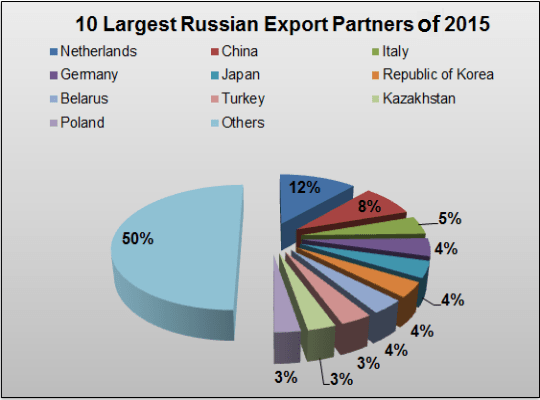 According to the Russia export data, Russia exported products mostly to the Netherlands, followed by China, Italy, Germany and Japan during 2015. Access the export data of Russia along with the Russia export statistics of top 10 importer countries to which Russia exported products in 2015 right here. Novorossiysk is the Russia’s largest and most important Black Sea container port. According to the Russia export data, here is the list of major Russian ports through which Russian export activities take place. According to the export data of Russia, below are the most searched export products of Russia.